DIY education publications & archives. Flyer to the launch of Contemporary Issues in Geography and Education (CIGE Correspondence Archive/1983/000032) copyright CIGE estate. My doctoral research focused on the recovery of the journal issues, correspondence archives, oral histories & biographies of an anticipatory intersectional anti-racist, anti-sexist DIY geography education journal series Contemporary Issues in Geography (CIGE) and Education (1983 – 1991) and the people and movement who gave it publishing life (PhD, University of Glasgow). I have published from this research in the Journal of Historical Geography (Norcup 2015), an article that was shortlisted for that year’s essay prize. I have also written about it in a chapter of Trevor Barnes and Eric Sheppard’s edited book Spatial Histories of Radical Geography: North America and beyond. (Antipode Book Series). I continue working with the archive and bringing forward some of the anticipatory intersectional ambitions of the publication. I have spoken about the journal series at a number of international and national academic conferences, as well as at public lectures. 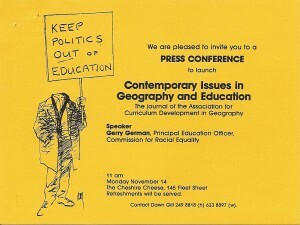 For example, I was an invited speaker at a day of public lectures entitled ‘Ways of Working: Alternative and radical education in schools’ * that formed part of the Alternative School of Economic’s art work / exhibition The Rich as a Minority Group. The title was taken from Anne Simpson’s essay found in issue 1.2 of CIGE. [* the second photograph on this webpage has Dawn Gill at the back of the room listening to me speaking about her endeavour to a full house at the Rabbits Road Institute, Old Manor Park Library, Romford Road, East London, 30th April 2016]. In 2018, I PDF digitised the back catalogue of the entire series of CIGE. This can be accessed for free download on the Geography Workshop website here. My continued work on this archive is facilitated via my honorary research fellow status in the Department of Geography, University of Glasgow, and dovetails with my research interest into the cultural histories and geographies of anti-racist / decolonising education projects of the 19th and 20th centuries, (see DLS: Photos and Phantasms) currently being supported by my honorary research fellow status based at the Yesu Persaud Centre for Caribbean Studies (YPCCS), University of Warwick.